Learn how to make a stylish multi-photo display with origami corner holders. These origami photo holders are super easy and quick to make! These origami photo or card holders are a unique and stylish way to display photos, cards, and artwork. If you have lots of small polaroids, this is a perfect way to display them without the need for expensive frames! You can display two or more photos with these easy to make origami holders. This origami photo display would make a great gift for birthdays, Valentine's Day, Anniversaries, Weddings or Mothers Day! You can make these as big or small as you'd like. It's recommended to start with paper that's about 10 x 5 cm. As long as the paper is half of a square, or the ratio of 1:2 it doesn't matter. To work out what size to use for different paper lengths, check out the origami paper ratio calculator. Your paper size is half a square. For photos, a good size would be 10 x 5 cm or 5 x 2.5 cm. 1. Start with your paper white side up (in this case the holder will end up being yellow). 2. Fold the bottom left corner up diagonally to the right, aligning with the top edge and crease well. 3. Next, fold the top right corner diagonally down to match the other side. 4. Now rotate the paper anticlockwise a little. Origami Tip: Make your folds as precise as possible, this really helps you to get the best result possible, and is really important when folding on a small scale. 5. Next, fold the left triangle in half. 6. Fold the right triangle in half. 7. Fold the bottom left corner up to the top right corner. 8. Open out the right triangle from underneath. 9. Pick up the paper, you can see there is a little pocket. 10. Insert the end of the top right corner into the pocket. 11. You now have a neat little triangle. 12. Fold the triangle in half. Depending on how many photos you want to display, make more of the little origami corners. If you have just two photos to display, you need only make two of them. You can attach each photo together by putting two on the top right and bottom right corner of the first one. You can angle the corners backward, to create a zig-zag effect with three or more photos. 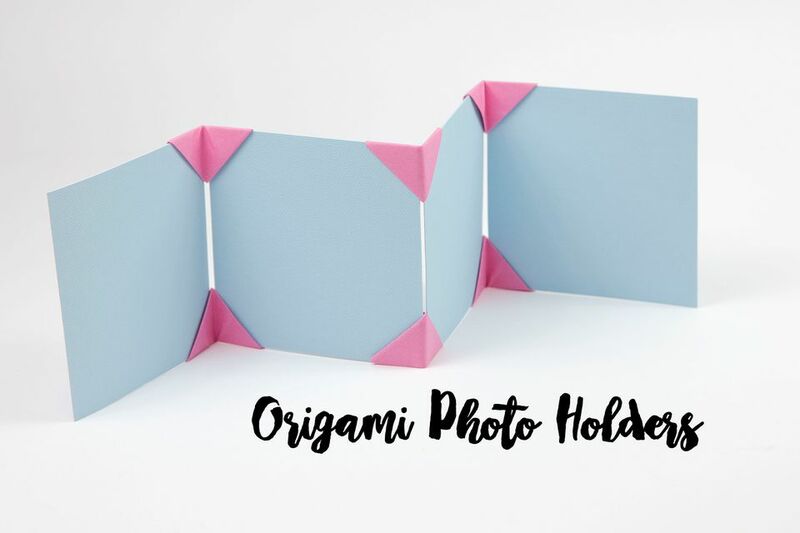 You can also create a triangle or square of photos using these origami photo holders. If your photos are not staying put in your origami holders, you may want to try using slightly thicker paper, slightly larger paper or textured paper for the holders! If you have some photos and negatives that need to be stored away safely, check out a simple origami photo storage pocket. MakeAndTakes.com has a great little origami frame tutorial for single square photos.